Location River Tees, South Bank. Downstream from Whorlton Bridge. Record Name Surface collection of lithic finds, white patinated flint with backed point of Early Mesolithic character, as Deepcar. 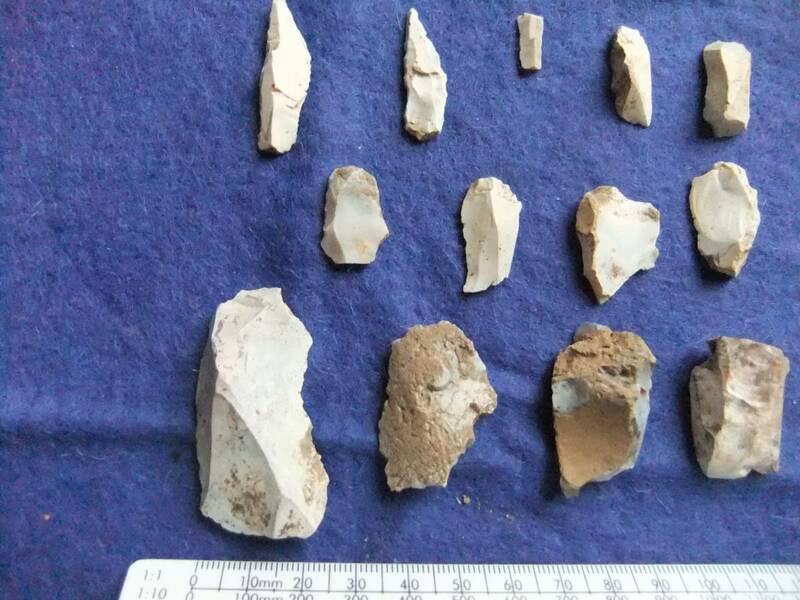 Record Description Surface collection of lithic finds, all of white patinated flint with backed point of Early Mesolithic character, Deepcar Type. 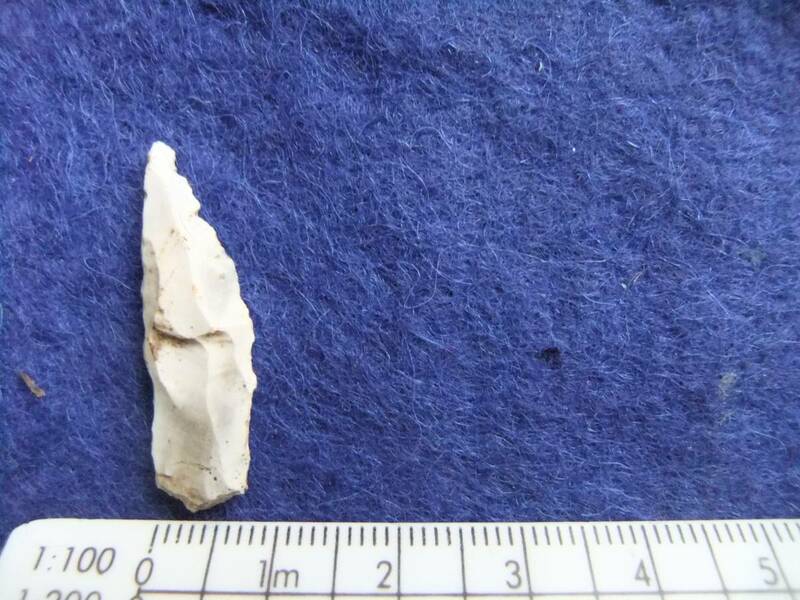 Additional Notes This small surface scatter, together with the similar lithic scatters at Wynch bridge and at Towler Hill is further evidence for the presence of occasional Occupation Sites on the north bank of the Tees which date to the 8th Millenium BC. References: Coggins, D., Laurie, T.C. and Young, R.1989. 'The Late upper palaeolithic and Mesolithic of the North Pennine Dales in the light of recent fieldwork.' in: C. Bonsall(ed.) 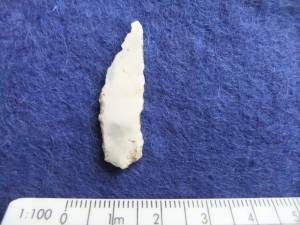 'The Mesolithic in Europe.' (Edinburgh).164-175. 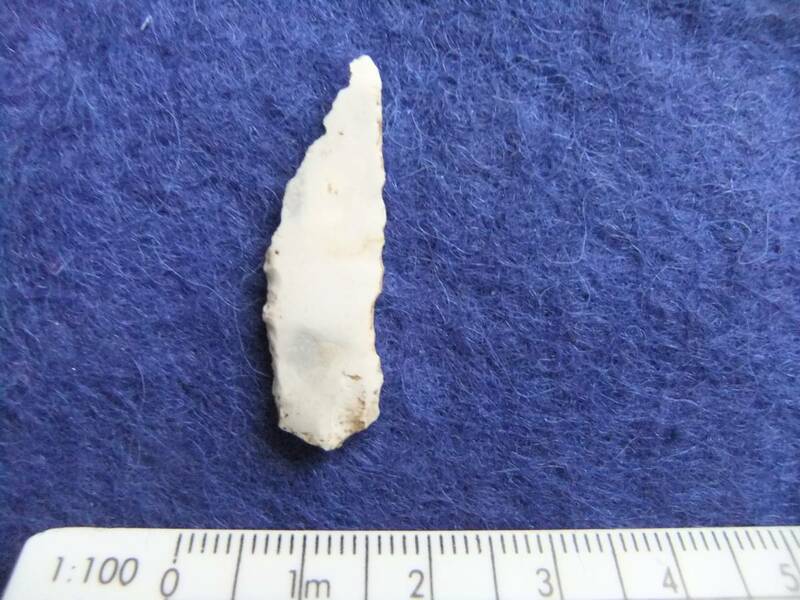 Radley, J. and Mellars, P.1964: A mesolithic Structure at Deepcar, Yorkshire, England, and the affinities of its associated Flint Industries.1-24' Penny Spikens, 1996. 'Rivers, Boundaries and Change: A Hypothesis of Changing Settlement patterns in the Mesolithic of Northern England.' In: Tony Pollard and Alex Morrison, Eds. 'The Early Prehistory Of Scotland', Edinburgh University Press. Image 2 Description Backed point of Deepcar Type. Dorsal view. Image 3 Description Backed point of Deepcar Type. Ventral view.